There’s an old proverb that you have to eat a pound of dirt before you die. Turns out that proverb has some wisdom behind it. According to the Hygiene Hypothesis, exposure to dirt, pets and everyday germs is good for the body and the soul. The health benefits of “dirt” include a stronger immune system, fewer allergies, better digestion, less heart disease, better stress management and a natural anti-depressant agent. If you want to know more about all those fabulous microbes in dirt and how “direct contact with soil has been shown to improve mood, reduce anxiety and facilitate learning”, check out The Dirt on Dirt produced by The National Wildlife Federation. Imagine all the fabulous ways kids can have fun in the mud. Parents can join in the fun with a family garden or you can sit back with a hose in hand to wash your child off after an afternoon playing in an outdoor mud kitchen. Dirt is nature’s supply for good not-so-clean healthy fun. The Family Garden: From container gardens with herbs and few vegetables to a lettuce patch inspired by Beatrix Potter, choose what works for you and your family. Kids of all ages can dig and water in a garden. Some children can weed without pulling out the flowers. You may want side by side patches so younger children can explore in their own space while you manage the edibles. The food to table lessons are far reaching. Time spent outside together, in dirt – priceless! Maybe, a worm rescue expedition! KidsGardening.org has fabulous resources for all kinds of garden activities. Mud Pit – mud bricks, mud balls, and mud men: Or, forget the pretty garden completely and dig a mud pit, or fill a plastic wading pool with dirt and water for the afternoon. You can definitely surprise your kids with “mud baths” once a month this summer. On a smaller scale, make just the right consistency of mud in a large bin or bucket and let your little engineer make a mud brick wall or a mud igloo for his or her play dinosaurs. How about mud balls and a very messy batting practice or a “mud man” (made like a snow man) to stand guard in the back yard? The Mud Kitchen: This is not your mother’s mud pies. This is how-to books, DIY design tips, outdoor kitchen sets to buy, entire Pinterest pages devoted to creative, beautiful mud play stations! 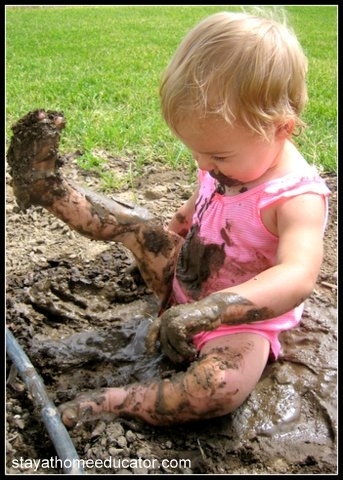 Your child can have a complete mud cooking adventure from cupcakes to stone soup. Stir it, sift it, bake it, even mud tea parties sans garden gloves – just add a little sparkle for the mad hatters and princesses. Just remember to station your mud kitchen away from the house and close to a water source for easy clean up. Mud Art: From sidewalk painting to muddy handprints, mud is a perfect medium for budding artists. Paint mud murals using delicate paint brushes or giant paint rollers. Splatter paint with fly swatters or child size brooms. The sidewalk is your child’s canvas or use an easy-to-wash outdoor easel for low-cost natural art experiences. Make mud sculptures using found or natural objects. Children can change the consistency for different projects and decorate with stones or leaves. They can even paint with their toes! Mud, mud, fabulous mud – it’s good clean fun!